Should ever be forgot . . . The fifth of November was always a bit of a performance in our household when we were young, culminating in a large conflagration of collected material in the field behind our dwelling. It would commence weeks before when, as youngsters, we would begin to accumulate all the fallen branches and other dead wood in the woodland behind where we lived. This we dragged to an open field which strictly speaking was private property but part of an abandoned market garden which hadn’t been cultivated for twenty or more years and bordered with a forest of impenetrable brambles. I guess the owner knew we were there but nobody seemed to bother us as we annually assembled our offering of remembrance to Guy Fawkes. The dead wood was one thing, but there was another element to our successful evening, cardboard. As we had a business in town my father used to collect and store all the boxes which had been once used to deliver goods. These were kept in the old air raid shelters at the back of the shop. The shelters had been built when the land had been commandeered by the government to construct protection for workers at the local tax office a few yards away. After the war they remained as a useful dumping place for all manner of unused and discarded shop materials. But I digress, as I mentioned, cardboard accumulated and from the middle of October was transported daily to our house where it was stored in the garage and shed. 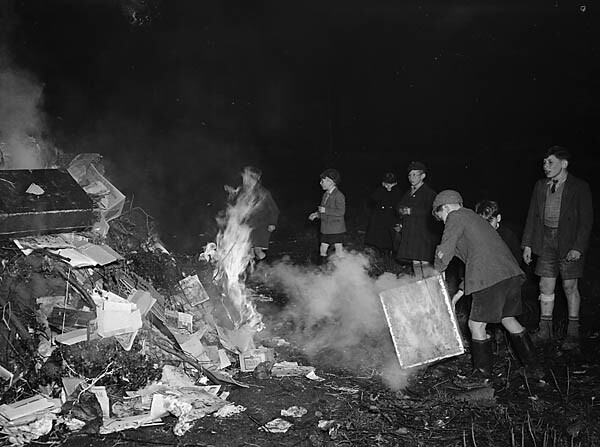 On the day of the big event it was all planned with some precision, on our return from school we’d grab a thick pullover, pull on our wellington boots and begin transporting the cardboard across the backs of the gardens of five houses to where the waiting bonfire was to be lit. As the oldest of the youngsters involved in this construction I was put in charge of the preliminary arrangements of assembling the ingredients and slowly pushing them into the crevices of the wood and branches we had previously collected. Darkness would have descended by five o’clock so we had to work fairly quickly and get everything moved as, when Dad came home from the shop, there would be yet another car full of cardboard to be transported to the field. Then we had to wait, there were meals to be had before we could light the fire, this always seemed to take an age as we were impatient for the off. The kids from next door and one or two other local youngsters who had been involved would be getting rowdy as they waited. Eventually though, usually about eight o-clock, we would be off, a procession of youngsters and a few adults would traipse from our garden to the designated area where my father carefully inspected the safety of the construction before putting a match to it. All too soon, after igniting the fire with that amount of cardboard, it would be raging and within thirty minutes would be mostly spent, a few thicker branches would probably crackle and pop in the dying embers for some while but for now our annual ritual was mostly over as we prodded the ashes with sticks and watched the fireworks which had been provided by Dad and the neighbours. We would then be led back to the garden where the catherine wheels would be nailed to the washing-line post and we would all wait until they had expired, the final sparks putting an end to another successful November the Fifth! Later as the evening worn on, the air would become thick with fog as the smoke from thousands of bonfires like ours accumulated and descended to create a shroud over the whole town. Early the following morning, unless it had been pouring with rain overnight, the gloom would still be hanging around as we kicked our wellington boots at the ashes hoping for a spark or two and searched for spent fireworks, before changing our shoes and wandering off to school for another tedious day only enlightened with exaggerated schoolboy tales of the previous evening’s exploits. I should have liked to use my photographs to illustrate this tale, but as I don’t have any that are suitable I have linked to the Geoff Charles Collection at the National Library of Wales. Great memories. I remember that catherine wheels never worked as intended and would either disappointingly fizz without spinning or would just fall off onto the ground. Did you ever check for hedgehogs? we didn’t although everyone says that you should these days. What about baked potatoes in the embers, I remember that these were delicious. 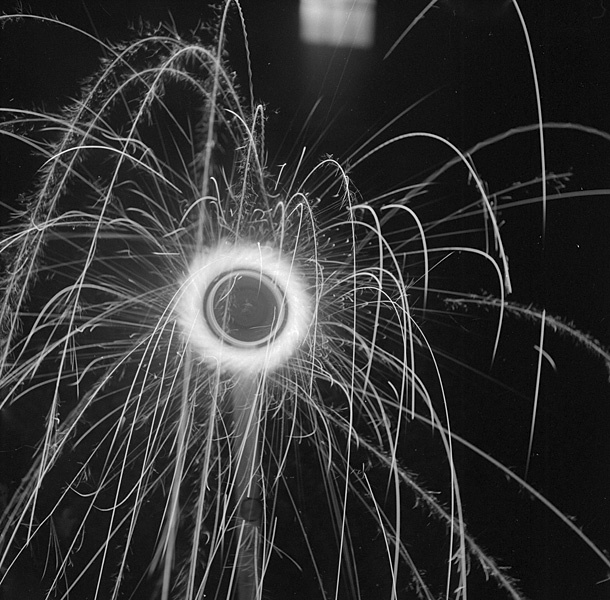 We always had the catherine wheels last and they were always something of an anti-climax after the other fireworks, they always worked as my father made sure they were fixed properly. As for cooking, no we never cooked on our fire, we had always eaten just before the bonfire and suppose it never occurred to us. Nobody ever mentioned hedgehogs back then, sometimes our fires were so stuffed with branches and other thngs we would have had to disassemble to check! Jumping jacks, had forgotten all about those Caroline, don’t think my father could have approved of those as I don’t remember them from our firework days, nor bangers for that matter!